Lenox 1972921. MetalMax delivers 1,000 or more cuts with no need for wheel changes. That is 30 times longer life than thin bonded cut-off wheels. Advanced diamond technology provides extreme durability in metal cutting applications, leading to increased productivity, reduced downtime, and a lower cost per cut compared to thin bonded cut-off wheels. LENOX MetalMax is made with diamonds, it doesn't get smaller. The cutting depth stays the same throughout its life, meaning better control, reach and precision. with LENOX MetalMax there is less odor and dust residue as the wheel does not wear down like bonded abrasives. Sparks originate only from the material being cut. One wheel, multiple materials: MetalMax is recommended for multiple types of metal including steel, sheet metal, stainless steel, rebar, cast iron, aluminum and non-ferrous metals. 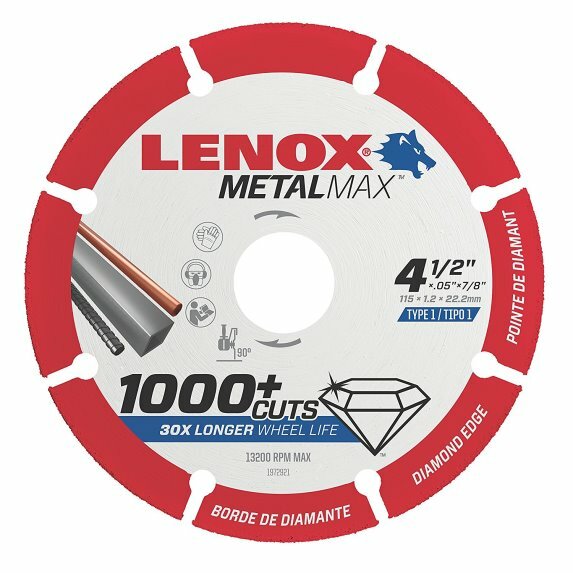 LENOX MetalMax is designed for use in the same power tools as bonded abrasive wheels, at the same RPMs and feed forces. No changes in operating settings are required. 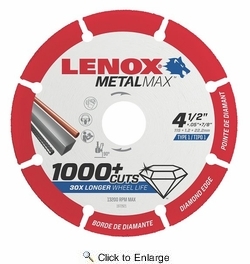 Use LENOX MetalMax as you would a bonded abrasive wheel.